We are a music design company specializing in engaging and competitive shows for young, developing, and small high school marching bands. Your show can include full customization, show-specific warmups, and a hassle-free website with practice tracks for your students. We can work with you to help you find your perfect show, then tweak and customize it so that your band sounds the best they can. The 2A Texas State Marching Contest was filled with amazing bands achieving at in incredibly high level. We are honored that all three medalists were clients of Luke McMillan Music Co. Congrats to the Valley Mills HS Band under the direction of Jon Schriver who earned the gold medal in class 2A playing “Vampire Hunter” (retitled as “Out of the Shadows") by Luke McMillan. Congrats also goes out to the silver-medalist Sundown HS Band under the direction of Mike Glaze, playing “The Glory that was Rome" by Barry Hurt, and also the bronze-medal-winning Thorndale HS Band under the direction of Michael Powers playing “Bailamos" by Luke McMillan. The third year for the ASBOA State Marching Contest was a huge success, as the quality of the bands saw a marked improvement over last year. Congrats to the Gurdon HS Band under the direction of Devin West, who played the newly commissioned “The Hidden Cathedral" by Luke McMillan. Congratulations also go out to the Foreman HS band under the direction of Darren Cooper for earning the bronze medal in class 2A, playing “Spartacus" by Luke McMillan. Under the direction of Dena Baity, The Rowva HS Band of Oneida, IL won first place in class 1A at the Geneseo Maple Leaf Classic in Geneseo, IL playing “Dr. Jekyll and Mr. Hyde" by Luke McMillan. They also swept most captions, including best auxiliary, best percussion, and best drum major. 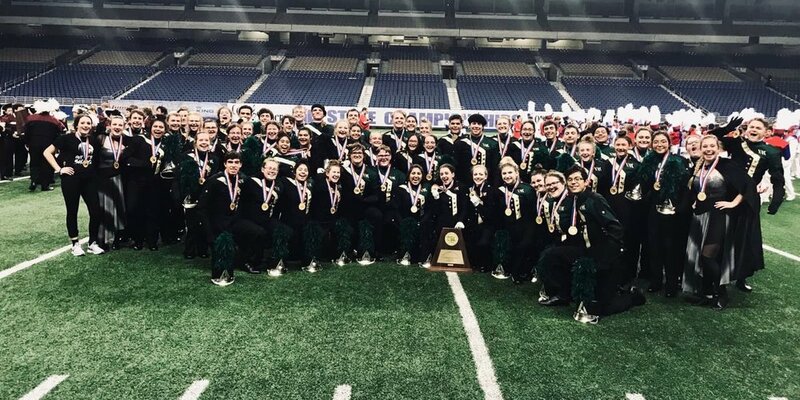 The Texas Association of Private and Parochial Schools (TAPPS) State Marching Contest hosted several amazing marching bands from across the state. The bands perform for a rating, and a Best In Class is selected from all of the bands that perform. Congrats to Lutheran North HS of Houston, TX, under direction of Laura Molitor, for bringing home the Best In Class award playing “Mission Beyond” by Luke McMillan. The Macon HS Band of Macon, MO, under the direction of Jamie Baker, won first place in class 3A at the Cameron Band Festival in Cameron, MO playing “Blood on the Captain’s Sword" by Luke McMillan. They also won the color guard and percussion captions, and won outstanding music for class 1A-3A. Our clients regularly tell us how their best marching seasons started when they began using our music, and we want you to be next. Find out more about how we can help you and your students achieve your goals in the future.